Guillaume Bodet, associate winemaker at Hyde de Villaine Wines, is our guest today. Tom Simoneau is in, so is Barry Herbst, while Dan Berger is on vacation this week. First, Guillaume tells about HdV in Napa, created in 2000. 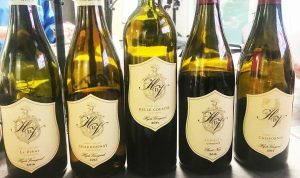 The Hyde family is from Carneros in Napa and the de Villaine family have been making high quality wine in Burgundy for many generations at the renowned Domaine de la Romanee-Conti, known as DRC. Today’s tastings from HdV Wines. The families are related by marriage. Aubert di Villaine’s wife is Larry Hyde’s cousin. In 1979 when Larry Hyde decided to plant a vineyard, Aubert de Villaine was visiting California. At that time there were herds of sheep on these hills and not a lot of vines yet. Later, Aubert had to return to France to run DRC. About 98% of HdV wines come from their own vineyard. They produce mostly Chardonnay, about 60% of their production, but they also make Pinot Noir, Syrah, Cabernet Sauvignon and Merlot. Carneros is known for its cooler climate because of its proximity to San Pablo Bay and the Petaluma Gap. The cooler air and fog in late summer is perfect for developing acid in the wine and flavors that are “pure to the varietal.” They do not interfere in the natural process, they don’t add any water or acid, they just respect the terroir and translate that into the glass. Guillaume Bodet tells about his education in chemistry and wine in France and his early work experience in France and California. 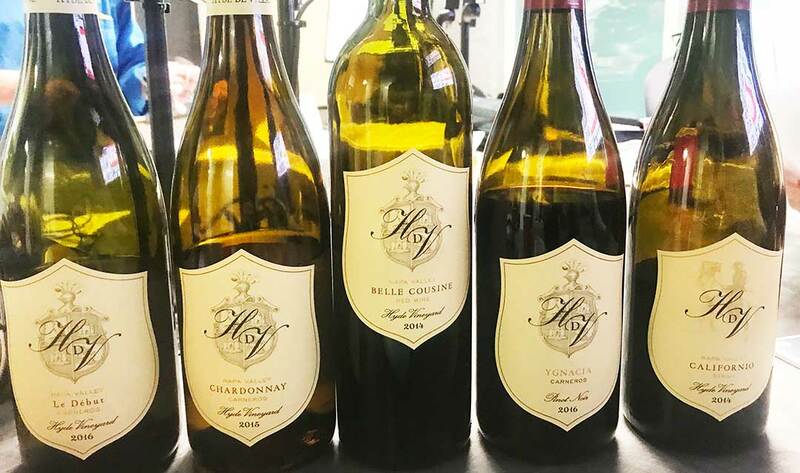 Tom says that Hyde is a popular vineyard, they have about 150 acres and about sell grapes to about 35 of the leading wineries in the area. Guillaume tells that Aubert de Villaine was part of the jury at the famous Judgement of Paris in 1976. Steve mentions an article in Esquire magazine, reporting a study done in France, which says that some California Wine is testing positive for radioactive traces from the Fukushima nuclear accident. Steve then plays a comedy bit from the Colbert Show. Steve and Tom agree that it must have been written by his friend Paul Mercurio who is a comedy writer on that show and that he put “Santa Rosa” and “Chardonnay” in the bit, for Steve. Steve Jaxon, Tom Simoneau, Barry Herbst and Guillaume Bodet. 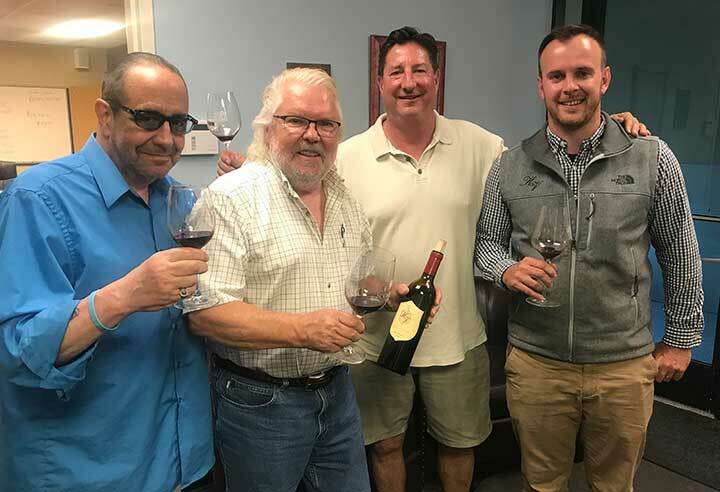 Guillaume Bodet describes the location of their winery and tasting room, on Sonoma Hwy and the winery is on Trancas Street in the northern part of Napa. Their tasting room is by appointment only. Tom Simoneau highly recommends it. They make about 4000 cases total, ranging from 50 cases of some varieties and 2100 cases of Chardonnay. They are in some of the high end restaurants and wine shops in the region. They also export small quantities to 17 different countries. 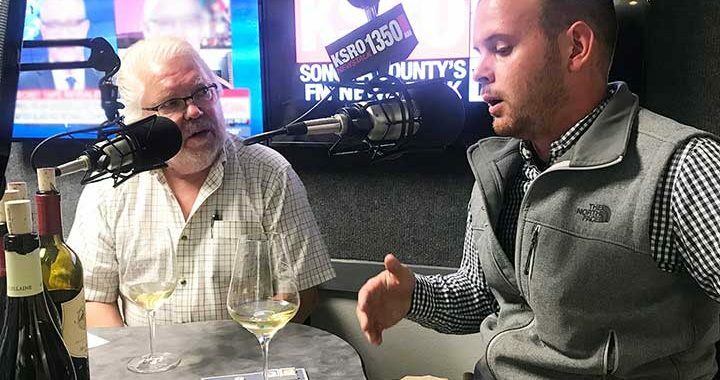 Tom says that what he likes about the bouquet of this Chardonnay is that it smells like grapes, and that he doesn’t want to smell oak or yeast when he takes his first whiff of a wine, he wants it to smell like grapes, and this does. It smells peachy. Guillaume mentions citrus and minerality, which come from the vineyard. This is their “Le Debut” Chardonnay which is done with no oak at all. They use a concrete egg-shaped tank. Steve asks Guillaume Bodet to explain the concrete egg. There is a coat of tartrate inside so the wine never comes into contact with the concrete. The virtue of the concrete is that it keeps the air out. During the fermentation, the shape of the egg means that the lees float up and then are pushed back in by the air pressure at the narrower top of the chamber. So it saves a lot of work so they don’t have to do any stirring. This method favors the primary characteristics of the fruit and the terroir.